Kinbrace operates two adjoining houses in East Vancouver. Our location allows easy access to essential services, proximity to affordable clothing and grocery stores, and quick transit to government offices in downtown Vancouver. Our large house provides transitional housing to newly arrived refugee claimants. Four single-room units on the second floor share a bathroom and are ideal for single people or couples. These units each have a kitchenette, electric stove, refrigerator, closet, bed and a small dining table. 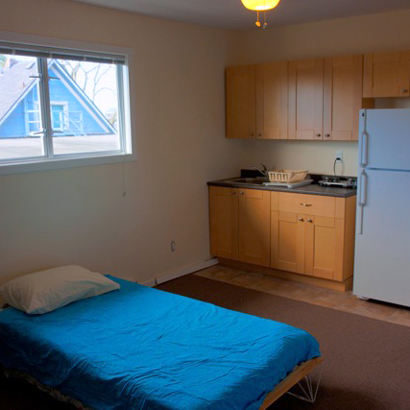 Two family-sized units (1 and 2 bedroom) are fully furnished with kitchen utensils, bedding, and furniture. Our smaller house, K2, provides much-needed common space for community meals, celebrations, workshops, and ESL classes. It also provides office space and housing for our core staff as well as on-site accommodation for interns. Renovations completed in 2010 make the space larger, brighter and more welcoming.